This northern cardinal has a birth defect that made it both male and female. The right side of its body is female, the left side is male. This cannot happen in humans because our sexual characteristics are determined by hormones but in birds each cell has a sexual identity that’s determined early in embryonic development. In bird species where males and females look the same it’s hard to tell this has happened but in sexually dimorphic species like the northern cardinal or evening grosbeak, it’s easy to see. 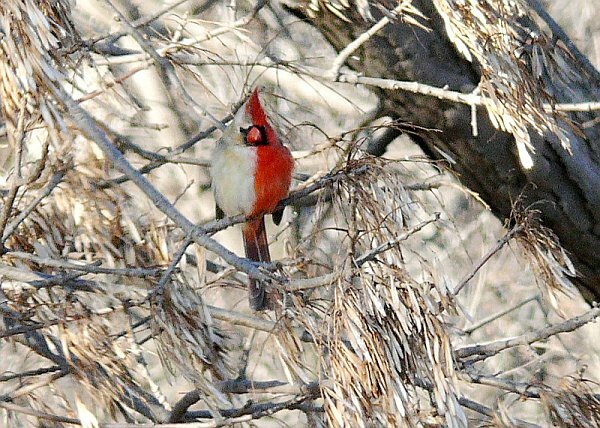 This particular cardinal from Rock Island, Illinois is now famous because he-she was studied extensively by Professor Brian Peer and Robert Motz of Western Illinois University. Their findings — “Observations of a Bilateral Gynandromorph Northern Cardinal (Cardinalis cardinalis)” — were recently published in The Wilson Journal of Ornithology and featured in Science magazine. Click here to see the press release at Science Daily. How incredible is nature?! Thanks, Kate, for this. Again….I would not have known unless I read your blog!! Before I started reading I thought that this was a photoshopped pic for sure. Very interesting. I enjoyed the links to other examples. Thanks. I would have thought that I had lost my marbles if I’d seen this bird in my yard. Now if I happen to see something like this in my yard I can say, “My oh my, a bilateral gyandromorph” and not feel like I need to run out to see my physician.